How to search for several pieces of information across all the fields and in all the records of a Table? For example, when we search for something on the Web we give several piece of text separated with , or + symbol to match any of the given text anywhere within the Web Pages and display the matching links on the screen. In the same way we can create filter to display records from a table that matches several piece of Text/numbers/Phrases across in any field in any record. Last week we have learned the usage of BuildCriteria() Function to filter data using only one field. BuildCriteria() Function can accept only one Field as its first Parameter. We will be using this Function here also. But, we will pull a trick for using this Function for all the fields in a Table. So let us do this with a simple Query and a Tabular Form. Import Customers Table from C:\Program Files\Microsoft Offce\Office11\Samples\Northwind.mdb sample database. 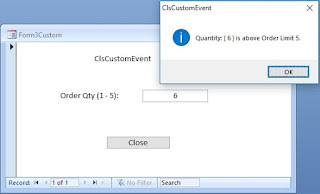 Create a Query using the Customers Table with all the fields and by adding a new Column with the name FilterField. FilterField: [CUstomerID] & " " & [CompanyName] & " " & [ContactName] & . . . etc. and join all the fields this way except HyperLinks, Objects and Yes/No Field Types. Save the Query with the name myQuery. This task you can automate with the following Program after creating a Query manually with at least one field from the Source Table and naming the Query as myQuery. You may modify the Program where the reference to myQuery name appears to implement your own preferred name, if needed. strsql1 = "SELECT " & tblName & ". *, "
strjoin = "[" & tbldef.Fields(j).Name & "] "
strjoin = strjoin & " & " & Chr$(34) & " " & Chr$(34) & " &  [" & tbldef.Fields(j).Name & "] "
strsql1 = strsql1 & "(" & strjoin & ") AS FilterField FROM " & tblName & ";"
Copy and paste the following VBA Code into a Standard Module and save it. Display the VBA Debug Window (Ctrl+G). This will modify the design of myQuery by joining all the fields, except HyperLink, Object, Yes/No and Memo Fields, from Customers Table, or any other Table that you use, and will create a new column with the name FilterField. If you need Memo Field contents too then you must add that Field manually in Query design. The CombineData() Program will not do this because HyperLinks, Object & Memo fields falls into the same field Type category and the validation check bypasses it. Create a Tabular Form (continuous form) using myQuery as Record Source and save the Form with the name frmMyQuery. Open the form frmMyQuery in Design view. Change the Visible Property Value to No. Make the FilterField column size very small on the Form (it is not visible on normal view) and resize other Columns to view their contents properly. Remove the columns like Region, Fax etc. or any other column that you feel not required for our Test Runs, so that all the required columns will fit on one Screen properly. Expand the Form Header Section and drag the column headings down so that we will get enough space to draw a Text Box and a Command Button beside it. Create a Text Box above the column headings. Display the Property Sheet of the Text Box (View - ->Properties). 'between coma and next search text item. MsgBox "Invalid Characters () in expression, aborted... "
Xchar = "* OR *"
Y_Filter = Y_Filter & "*"
Type some Text/Numbers/Phrases separated with comas (,) or plus symbol (+), which can match in any part of any Field(s) or in different Record(s), in the Text Box. NB: Do not use brackets "()" in the search text. These will run into errors when used in the BuildCriteria() Function. Users may type extra spaces between the text separator character , or + symbol and the next search text item and these spaces will be removed by the program before going in for search and filter operations. Embedded spaces in phrases will be left alone in the search text. Click on the GO> Command Button to search for the given text in fields/records and filter those records on the Form. You may inspect the filtered records to ensure that one or more of the search text you have entered into the Text Control appears in all the filtered records. They can appear in any field or fields in any Record, but all the records filtered will have these text/number/phrases on them. I enjoy the way you capture the substance of the concept, really great writting style, I enojoyed it!